A confit is meat (duck, pork, chicken, ....) that is preserved by salting and seasoning it with herbs, then slowly cooked in its own fat, stored with its cooking juices, and sealed with its own rendered fat in a jar or can. The term comes from the French word "confire", which basically means to preserve. Marie-José "Zézé" Fournier graciously allowed me to take notes while she prepared a confit of pork. Marinating time: 2 days ! In France you'd buy "rôti de porc dans le filet" or "rôti dans la longe de porc sans os" or "filet de porc"
You may also use pork tenderloin, but it is easier to use a tied roast. The meat will shrink quite a bit during the baking. Obviously the amount you need, depends on the number and size of canning jars you want to fill, and the number of mouths you need to feed (if you insist on sharing). Pure rendered duck fat ("graisse de canard"). This is a mandatory ingredient for the flavor! You will need about 4 tablespoons per kilogram (2 lbs) of meat, and maybe some during the canning, so a small jar goes a long way. An unopened jar can be kept for years, much longer than a plastic tub. This tasty stuff is also great for home-frying potatoes and eggs! "Four spice" is a tropical bush (Myrtaceae family), with leaves and fruits that taste like a mix of (white) pepper, cloves, nutmeg and cinnamon. It is also the name of a mix of these spices. There is no standard mix, and "four spice" blends may actually contain as many as seven spices. The store-bought "four spice" mix that I used consists of ground cinnamon (44%), ground ginger (24%), ground cloves, and ground nutmeg. You can try a mix of 2 teaspoons ground cloves, 2 teaspoons ground nutmeg, 1 tablespoon freshly ground peppercorns, 1 teaspoon ground cinnamon. 1 teaspoon ginger powder. "Four spice" is not to be confused with Chinese "five spice" mix (ground star anise, fennel seeds, cassia or cinnamon, cloves, Szechwan peppers). Large pot for sterilizing the jars and lids (you must be able to fully submerge the jars). A 1 kg (≈ 2 lbs) roast will take at least 8 holes. Fully insert a entire peeled garlic clove into each pocket. This is best done after putting the meat into the container(s) in which it will be marinating. Lightly salt all sides of the meat. Sprinkle freshly ground pepper on all sides of the meat, and pat in (e.g., by rolling the meat in the container). 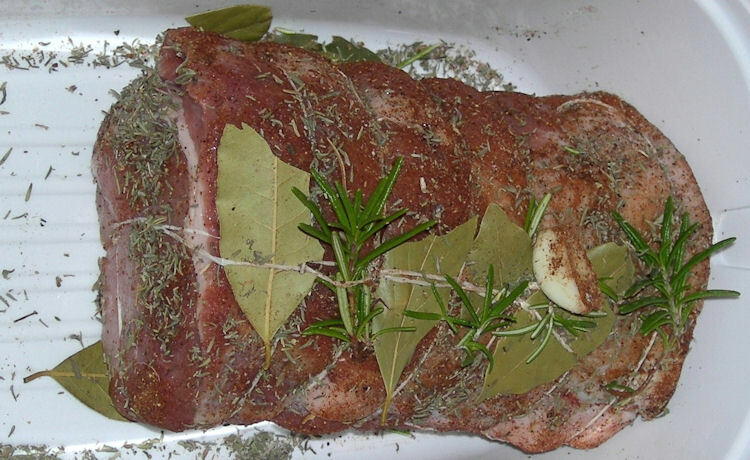 Put pieces of fresh thyme sprig on top of the meat (under the string) and along the meat. 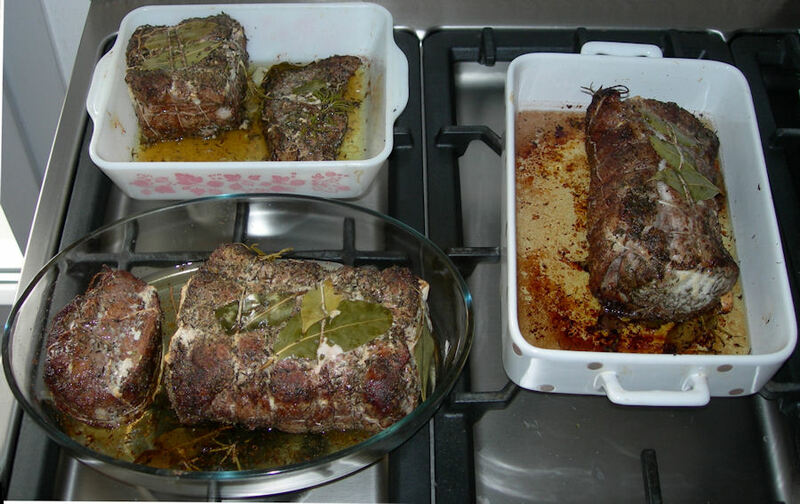 Transfer the meat to the oven dish(es), together with any herbs & spices that are left behind in the container. Put tablespoon-size dabs of duck fat on top of the meat. Baking time depends on the size/weight of the meat. If the largest piece is about 1 kg (≈ 2 lbs), expect baking to take up to 1.5 hours). When the meat is done, it should look like in the photo below. Remove the dishes from the oven and let the meat cool off. Do not discard the juices! Sterilize the canning jars and the lids in a large pot of boiling water for about an hour. Make sure the jars are always fully submerged. Remove the jars and lids from the pot without touching the rims and the inside of the jars and lids. If the there is not enough juice to almost cover at least 3/4 of the meat, melt some duck fat and add to the jar(s). The meat does not have to be fully immersed in juices and duck fat. Put the lids on the jars and tighten. Return the jars to the pot of water and turn the heat back on. Counting from the moment that the water begins to boil, continue cooking the meat for 2 hours. Turn off the heat and let the jars cool off in the water. Check that the lids of the jars have "popped" in. Serve warm, or cold (in summer). Keeps for months without refrigeration. ©2007-2016 F. Dörenberg, unless stated otherwise. All rights reserved worldwide. No part of this publication may be used without permission from the author.